Fynnlan is 31 weeks old today! This weekend we traveled to the Catskills with a huge group of friends. It was so great to get out of the city for a couple of days and relax with friends. It was a super hot Memorial Day Weekend this year, mid 90's!! 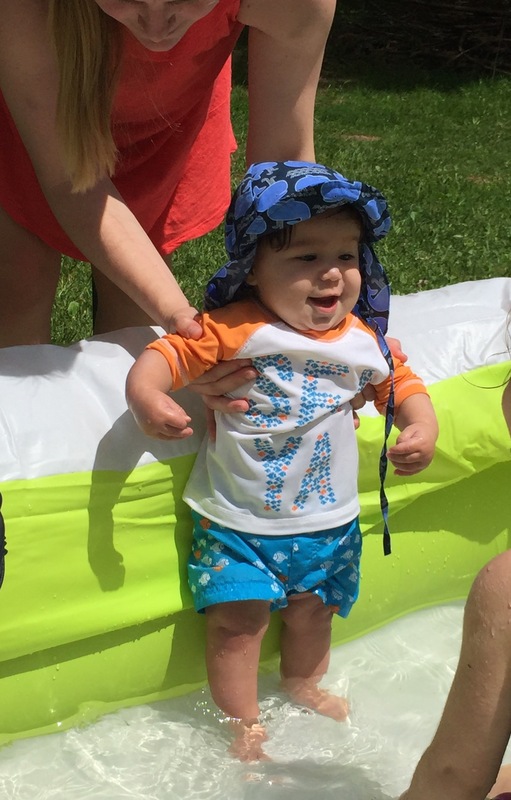 So we spent most of the weekend outside, and Fynn even got in the pool for a bit! He seemed to enjoy it, though it was short lived since there were lots of big kids around. We've continued trying to have Fynn and Aly in the same room together at night. He was still continuing his habit of waking around 11, and I went ahead and fed him to not disturb Aly. I knew the weekend would be crazy anyways, so we waited until after the weekend to try and get him back to sleeping through the night. So Monday night, we moved Aly into our room so Fynn wouldn't disturb her if he woke up. So we're two days into re-sleep training Fynn haha. Hopefully we can move Aly back in soon! I can't remember if I've mentioned that Fynn's other tooth has popped through, so now he has 2 bottom teeth. Fynn is into everything right now. He is pulling up on everything and crawling so fast. He is a magnet towards cords, phones, and anything else he shouldn't be getting into. Standing all the time now! They love each other so much! good thing we lowered the crib!